Studies for my Ph.D. in English included history of the English language, linguistics and related subjects. My detective work concerning texts, including linguistic analyses, involved such cases as the Beale treasure papers (see The Virginia Magazine of History and Biography, July 1982), the text of which I demonstrated was part of a hoax, and Abraham Lincoln's questioned Bixby letter (treated in my dissertation), which I authenticated. In 1997, by invitation, I became a member of the International Association of Forensic Linguists. 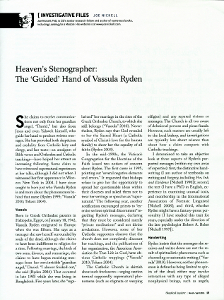 I frequently use linguistic evidence in my articles for Skeptical Inquirer, including the case of "Heaven's Stenographer" March/April 2011) and "Ghost Author?" 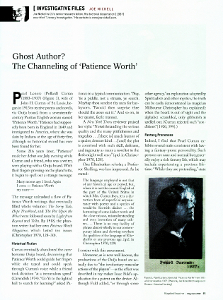 (May/June, 2012, as well as for Skeptical Briefs, including "Abraham Lincoln: An Instance of Alleged 'Spirit Writing'" (September 2004) and "A Case of Automatic Writing from Robert G. Ingersoll's Spirit?" (December 2007).